← Ten Proofs That There is No God. There’s no question that religion can have some ugly moral and social consequences. The homophobic and misogynist attitudes of many American Evangelicals come straight out their sacred texts. So do the Islamic concepts of “dhimmitude” and jihad. So does the Jewish notion of favored bloodlines. So do Mormon and Scientologist recruiting practices. The Bible prescribes the death penalty for thirty six infractions, ranging from childhood disobedience to marital infidelity to witchcraft. The Quran contains over a hundred verses sanctifying the slaughter of infidels in one context or another. I’ve argued in the past that religion disinhibits violence rather than causing it, but in a world of complex causation, one where straws sometimes break the backs of camels, that may be a distinction without a difference. The fact is, putting God’s name on Iron Age morality contributes to Iron Age behavior. 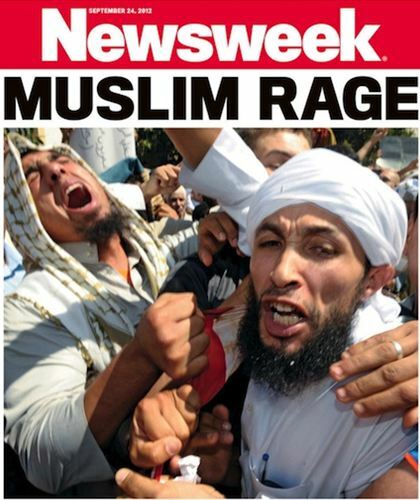 That said, over a million Muslims in the U.S., when they heard that pockets of men in Libya and Egypt were rioting over a blasphemous film, declined to do the same. Globally, 1.6 billion Muslims sat home and sympathized with the rioters or with those killed and their loved ones, or simply went about the business of getting their kids fed. The point is that, whatever their sympathies, the percent of people who acted badly was miniscule. By contrast some took the risk of helping. From the standpoint of humanity’s shared moral core, most people of faith are more restrained, humble, and compassionate than the writers of their sacred texts. Given that Islamophobia is rampant in the U.S. and is often promoted by conservative Christians, many progressives want to deny that bigotry and vengfulness are baked into Islamic texts and traditions. 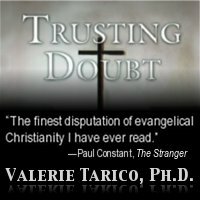 Atheist forums that routinely bash Christianity and Judaism are sometimes strikingly silent or even defensive of Islam as a maligned religious minority. Conservatives, on the other hand, see bigotry and violence as the heart of Islam. Somali-Dutch feminist and atheist Ayaan Hirsi Ali is despised by many liberals because of her unrelenting criticism of Islamic misogyny. She was welcomed with open arms into the conservative American Enterprise Institute – despite her atheism and feminism – for largely the same reason. The enemy of my enemy . . . . Both of these positions, that Muslim sacred texts are benign and that they represent the priorities of most believers, deny large swaths of reality. Religions change and evolve along with culture and technology. Yes, they are inherently conservative, codifying roles and rules that have worked for our ancestors, and so they often create a counterweight (for better or worse) against cultural and moral evolution. But they are not static. Most modern day Muslims do not sanction child marriage and beheadings any more than most Christians or Jews agree with the Bible’s endorsement of slavery and animal sacrifice. But looking at the media you’d never know it. It is ironic that the religionists who have figured out best how to leverage modern media are those whose theologies are most backwards facing – those who fear cultural and spiritual change and who yearn for a never existent past paradise based on some Muslim or Christian or Jewish form of sharia. When it comes to the absence of moderate voices in the press, the fault lies with both moderate people of faith and with media gatekeepers. In U.S. Christianity, fundamentalist dominance of the airwaves is no accident. From the 1940’s to the 1970’s, the Federal Communications Commission gave airtime grants to the National Council of Churches, which was seen as providing a community service because it used the time for ecumenical outreach. Moderates got complacent. By contrast, evangelicals and other fundamentalists were forced to pay for airtime. They responded by building networks and then empires that spanned the radio and television spectrum and the globe. I have actually seen some of these demonstrations, most recently in Islamabad, and all I would do if I were a news editor is ask my camera team to take several steps back from the shot. We could then see a few dozen gesticulating men (very few women for some reason), their mustaches writhing as they scatter lighter fluid on a book or a flag or a hastily made effigy. Around them, a two-deep encirclement of camera crews. When the lights are turned off, the little gang disperses. Unfortunately, a certain Florida pastor and a network of Coptic Christians seem to have learned the same lesson: build the drama and the media will come. Finally, finally, after years of ceding center stage to fanatics, it appears that moderate Muslims and Christians are figuring out how to reclaim the media and use it in the service of more thoughtful and humane and –dare I say it—evolved versions of Abrahamic faith. Some of the efforts are organized and funded. The Center for Faith in Public Life, for example, distributes news and opinion from a theologically and politically progressive perspective. When Catholic nuns launched their two week bus tour to protest against the Republican budget proposal, a variety of groups including the Center helped them garner earned media. But even more hopeful signs can be seen in the informal use of social media. Facebook groups like The Christian Left and Christians Tired of Being Misrepresented crank out images and foster discussion that the Religious Right would hate. In the aftermath of recent riots, Muslims in Libya organized a peace rally and used social media to convey their dismay. 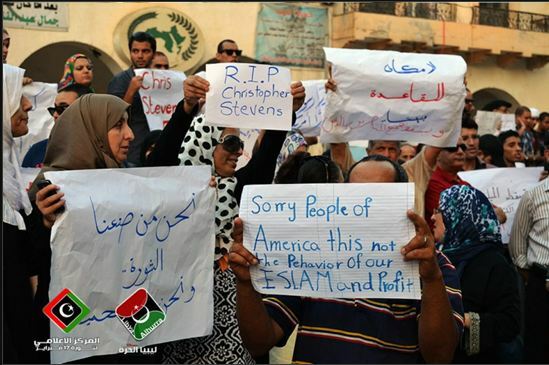 “Thugs and killers don’t represent Benghazi nor Islam,” said one sign. “Terriost (sic) has no religion,” said another. “RIP, Chris,” said a third. The signs were clearly home-made and heartfelt. As a woman, I was struck that, unlike the more familiar Rage-Boy-riot crowds, the peaceful rally included women, some in hijab, others not. In Sydney, Australia, when fundamentalist Muslims started sounding ugly recently, the response of moderates was fast and public. Saturday, a young Muslim girl spoke at a conference advocating the establishment of an Islamic caliphate – a global government of all Muslims with sharia law. Her speech hit the internet on the heels of a rally in which a preschool boy was photographed holding a sign that said, “Behead all those who insult the prophet.” Community leaders condemned the actions of the boy’s mother and emphatically stated their own opposition to radicalizing children. In the Arab and Muslim press, scholars and social critics have voiced what Thomas Friedman is calling “a moderate backlash against the extremist backlash. The cure for #muslimrage – killing pigs … on angry birds. One of the Twitter users had a message for co-religionists: Memo to those few violent MidEast protesters, this is how you fight Islamophobia. You make fun of it. This article first appeared at Alternet. Gallery | This entry was posted in Musings & Rants: Christianity and tagged Benghazi, fundamentalism, humor, Libya protest, moderate religion, Rage Boy, religious violence. Bookmark the permalink. 10 Responses to Why Do the Craziest Religious People Get the Most Attention? It looks like the content of your comment didn’t come through. A calm voice of reason and hope. Thank you. And I agree — gentle humour can be very effective but it must come from within. Bible this, Bible that. I KNEW it was a mistake to bind the Old Testament in the same volume as the New Testament!!! It’s a lot like, if not exactly like, binding the Magna Carta and our Constitution in the same volume and calling it Rules For America. Ay chihuahua! Yo, dude! The penalties you speak of are from the Old Testament. There is nothing of value in the Old Testament, it only serves as a bad example of religion and how really silly things can get. So, if you want to know about God you read/reference the New Testament – the Letters and Gospels, taking your brain out of neutral while doing so. What?! I thought the Old Testament was inerrant special revelation — just like the New. I too have a moustache, but am unable to make it writhe, on its own anyway. Makes you wonder if the Singing Nun, among others, was the start of the media take over by the religious.